I don't care what it was originally called--it's not very funny. Nickelodeon and Paramount have released SpongeBob SquarePants: Triton's Revenge, a compilation of seven episodes from the front end of SpongeBob's seventh season. Episodes included are The Clash of Triton (a.k.a. : Neptune's Party), Sand Castles in the Sand, Shell Shocked, Chum Bucket Supreme, Single Cell Anniversary, Tentacle-Vision, and I Heart Dancing. As to the quality of the shorts for these later individual SpongeBob releases, it's often catch-as-catch-can, and SpongeBob SquarePants: Triton's Revenge comes in at about mid-level with some genial also-rans, but an unfunny headliner (particularly disappointing following the excellent SpongeBob's Last Stand). And don't be fooled by that DVD title (like my kids were); there is no new SpongeBob short called "Triton's Revenge" on this disc; that's just a little marketing ploy...and not a particularly nice one, either. I've written extensively about SpongeBob SquarePants in previous reviews, so I won't go into a lot of background on the series and its place in pop culture ((you can click on SpongeBob SquarePants: Season 4, Vol. 1, SpongeBob SquarePants: Season 4, Vol 2, SpongeBob SquarePants: Friend or Foe, SpongeBob SquarePants: Season 5, Vol. 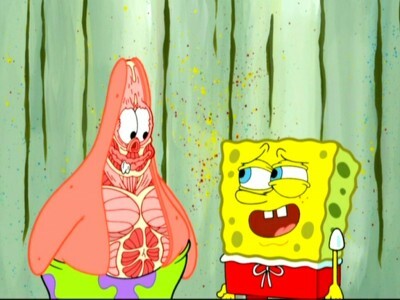 1, SpongeBob SquarePants: Pest of the West, SpongeBob SquarePants: WhoBob WhatPants?, SpongeBob SquarePants: Season 5, Vol. 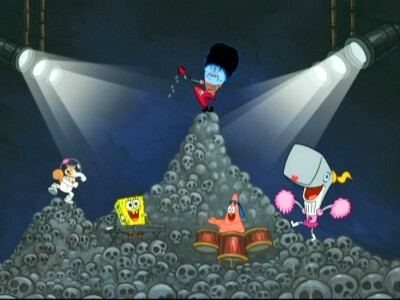 2, SpongeBob SquarePants - Spongicus, SpongeBob SquarePants: To SquarePants or Not to SquarePants, SpongeBob SquarePants: Season 6, Vol. 1, SpongeBob SquarePants: Truth or Square, SpongeBob SquarePants: Viking-Sized Adventures, and SpongeBob SquarePants: SpongeBob's Last Stand for those reviews). A reoccurring theme in my last few reviews has been the feeling that if SpongeBob hasn't outright been slipping in quality since Season Five, it's at least been wildly inconsistent, perhaps due to the increased number of episodes being produced (Season Six had 39 episodes alone, while Season Seven planned 26). So a "hit-or-miss" feeling has definitely creeped into these stand-alone SpongeBob discs, because you never know what you're going to get. 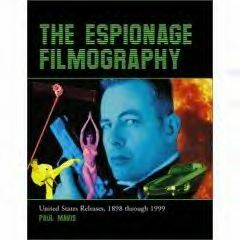 Previously, no doubt due to marketing considerations to distinguish these stand-alone disc releases from the split-volume season sets, unaired toons were slapped onto collections of previously released titles as a headliner come-on. Sometimes it worked (Pest of the West), and sometimes not (Spongicus or WhoBob WhatPants), but the "headliner" was always a real episode that hadn't aired yet. Not so with SpongeBob SquarePants: Triton's Revenge. There is no "Triton's Revenge"--just The Clash of Triton, which was already a re-name of Neptune's Party...and it's already aired prior to this disc's July 13th street date. I don't keep up with SpongeBob on television like I used to, but my kids do, and when they saw the disc for SpongeBob SquarePants: Triton's Revenge arrive, they naturally assumed that it featured a "new" SpongeBob short...which it didn't, to their disappointment. Let's hope Nickelodeon doesn't pull that bait-and-switch again with their little DVD buyers. As for headliner "Triton's Revenge" or The Clash of Triton or Neptune's Party or whatever the hell it's called...it's one of the more sorry examples of these later SpongeBobs I've seen, with a too plot-heavy storyline, and a surprising paucity of good gags. King Neptune (John O'Hurley), turning 5,000-years-old today, lays in his bed, too depressed to do anything other than watch daytime TV. Sad over his estrangement from his son, Triton (Sebastian Bach), the King may feel better when he attends his birthday dinner at The Krusty Krab, arranged by his wife, Queen Amphitrite (Victoria Beckham). Of course, SpongeBob blows it by mentioning the absence of his son from the party, wherein he decides to bring the feuding father and son together. 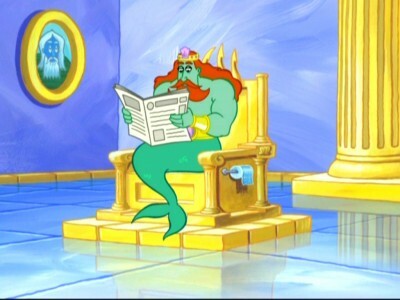 Although there are a few, isolated funny sight gags here and there (SpongeBob in drag is always good for a laugh, or Neptune on his other throne, complete with toilet paper roll, or the brief shot of the spectators with shards of glass in their eyes and faces), The Clash of Triton spends way too much time on exposition, setting up the short's premise, while skimping on what should have been a priority: the jokes. SpongeBob is barely in it (always a mistake to make him a secondary presence), while the vocal...ahem, "talents" of Victoria Beckham are to put it bluntly, the only truly laughable thing in The Clash of Triton (why in the world would Paramount think that putting a special little sticker on this DVD's shrinkwrap announcing Beckham's role here, would matter in the slightest to DVD buyers?). As for the painfully unfunny Triton character, suffice it to say: can SpongeBob and every other cartoon in the world please retire the Spicolli-inspired "surfer dudes" from their repertoire of clichéd characters? It's enough already. As disappointed as I and my kids were with The Clash of Triton (my nine-year-old yawned and said, "That's it? Not funny," when it was over), you don't need to take my word for it; just listen to the two fish spectators--a SpongeBob staple--who dismissively comment, "This is a rip-off!" and "Things just got lame again!" as the short progresses. They know what's what. Much better as far as gags go, but ham-fisted when it comes to its obvious, overblown message, Sand Castles in the Sand takes a simple premise--Patrick and SpongeBob go to the beach--and gets quite a bit of mileage out of that basic framework. Good bits include Patrick ripping off his face in anticipation of going out, and SpongeBob annoying everyone on the bus ride, and I particularly enjoyed the "small plastic disc that you can throw" gag. But once you see where the short is going (right into familiar Dr. Seuss Butter Battle territory), it's only a matter of time before a mushroom cloud appears for our little subliminal message for the day. I don't watch SpongeBob for a message; just make me laugh and entertain me. Stick your message, SpongeBob. Shell Shocked works much better because it escalates its destruction gags expertly. 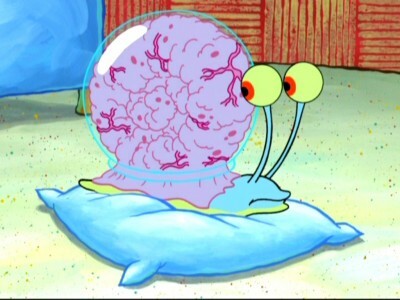 SpongeBob breaks Gary's shell (some good gross-out shots of Gary's soft, shelled body), so it's off to Angry Jack's Shell Emporium (voice work of Dee Snyder), who has a hilarious TV commercial parody of all those frenzied "madman" pitchmen, where he tells the viewer not to bring the kids, and clues them into why he's so angry ("The wife's gone for good!"). 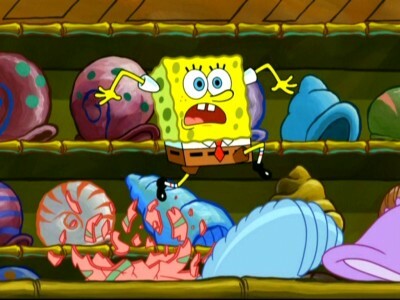 Naturally, SpongeBob starts breaking every shell he sees, starting slow before he's running across rows of them, singsonging, "Why...can't...I...stop...breaking...shells?" --a great bit. Chum Bucket Supreme is a solid Plankton entry (he's the only secondary SpongeBob character who can anchor his own short) premised on, what else, trying to get more customers into The Chum Bucket (or as he later calls them, "doo-doo dunderheads"). Big laughs come Plankton pretending to eat his own chum, from his rear-end-shaking dance (always funny), Patrick having a brain emergency (his "Department of Thoughts" catch on fire after he tries to think too hard), and always a SpongeBob showstopper: customers barfing into buckets. Any SpongeBob short that references A Face in the Crowd is a winner with me. Continuing with another Plankton entry, Single Cell Anniversary finds Plankton having to give his computer wife, Karen, an anniversary gift (which he forgot), or else he won't get the present she got for him: the Krabby Patty formula. 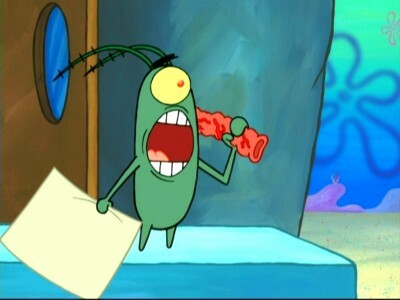 I don't know what's funnier: Plankton's speech about the "stench of failure" on him, or his screaming, "Get your hands off my wife!" when SpongeBob bangs on Karen's keyboard. Tentacle-Vision is a seemingly promising but ultimately minor outing for Squidward, whose favorite cable access show, Fab and Fancy, is pulled for The Guitar Lord, hosted by Zeus (who doesn't have a guitar yet). Wanting his own show, Squidward hosts Squidward Chat, but of course, SpongeBob and Patrick crash it in the name of "helping" Squidward, and some silly jokes follow (Patrick licking and chawing on the camera lens, or running home to see himself on TV...and only getting snow), before the short peters out without a solid pay-off. 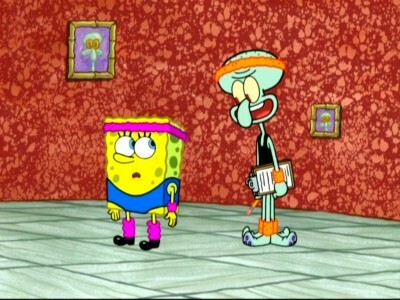 And finally, I Heart Dancing gets in a few good bits with SpongeBob's exuberant dancing (Squidward and SpongeBob in unitards, headbands and leg warmers is probably the short's chief claim to humor), and a funny spoof of big Hollywood show-stopping dance montages, but again, the short ends without fully satisfying the set-up. As usual with these SpongeBob SquarePants DVDs, the full screen, 1.33:1 video transfers for the shorts look terrific, with incredibly bright colors and a super-sharp picture. There were no big compression issues to speak of (although interlacing is noticeable from time to time). Edge enhancement is acceptable. The Dolby Digital English 2.0 stereo audio track is perfectly acceptable here, with appropriately loud recording levels and some discreet directionality. All dialogue is cleanly and crisply rendered. Close-captions are available. Two shorts (less than two minutes long) are included from The Clash of Triton, while an episode of Fanboy & Chum Chum is included. I don't like Nickelodeon trying to create the impression that this stand-alone disc has a new SpongeBob short on it called Triton's Revenge...because there is no such episode. Even worse, the actual headliner here, The Clash of Triton, is seriously sub-par. Luckily, the other six shorts included here are a step-up in quality, nudging SpongeBob SquarePants: Triton's Revenge into the recommended slot.